It's back! 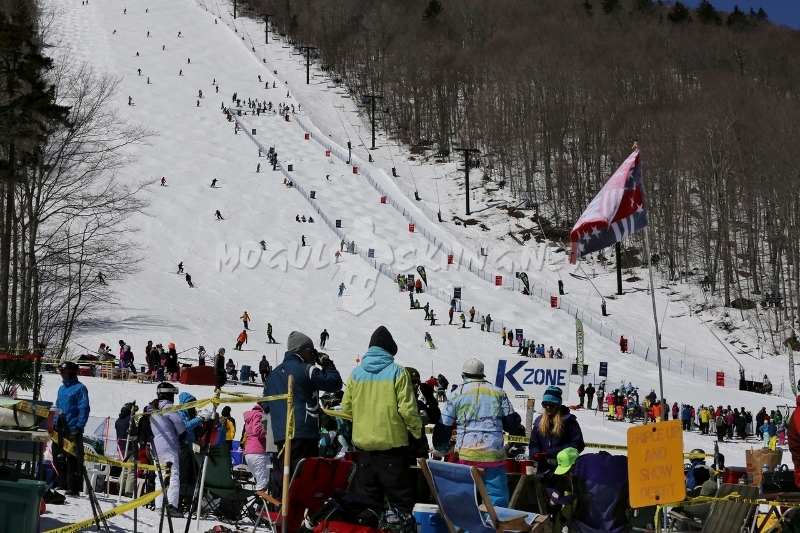 One year after being cancelled and left for dead the infamous Bear Mountain Mogul Challenge roared back to life on April 6th at Killington Vermont. Approximately 150 participants signed up to compete in this year's revived event. And, while that number on its own would have been enough to consider the event a success, it was the return of the infamous party crowds of years past - complete with crazy outfits, loud music and elaborate tailgating setups - that was embraced by BMMC devotees as a sign that the event is on a path back to its former glory. Though there were few changes to the 2013 edition of the event. This year Killington enhanced the traditional BMMC schedule by adding two United States Ski Association mogul competitions to the weekend's events resulting in three straight days of mogul skiing competition starting on Friday morning. "Our goal is to make this into a kind of three day long bump skiing festival" said Killington Mountain School Athletic Director Matt Gnoza, noting that the mountain hopes to continue pairing the competitions in future additions of the event. Bear Mountain Mogul Challenge events officially started on Friday night with a kickoff party at Sushi Yoshi on the Killington access road. Aside from the usual raffle for prizes this event provided a venue for the presentation of the starting order for Saturday's competition. Many of the competitors who attended the kickoff party had skied earlier in the day and reported that the course was in great shape. Expectations were high that Saturday would be an epic day of competition. Unfortunately, after a day of spring like weather on Friday temperatures dropped well below the freezing mark overnight and competitors were greeted by rock hard conditions on Saturday morning. Event staff quickly postponed the event start from 10:00am to 11:00am to give the sun time soften the course. At 11:00 conditions were still firm but much more skiable and athletes could finally be seen gingerly warming up on the course. Meanwhile a much more anxious crowd of party hungry spectators was hard at work erecting what amounted to a small town at the bottom of Outer Limits. Easy-Ups, lawn chairs, tables, blenders, gas grills, couches, fake palm trees and a vast assortment of food and beverages all made its way onto the hill. By mid-day, as multiple stereo systems vied for dominance, it was obvious that the spectators' festivities had gained significantly more momentum than the actual competition. But the competition did eventually get underway and the event staff was soon busy giving each of the 150 or so competitors their shot at qualifying for Sunday's dual eliminations. For the competitors it quickly became obvious that simple survival would be the goal of the day. Longer, and set higher up on Outer Limits than in past years, this year's course was the undoing of many hopeful champions. Specifically it was the top jump's steep, treacherous landing that took out a vast number of otherwise competent mogul skiers. 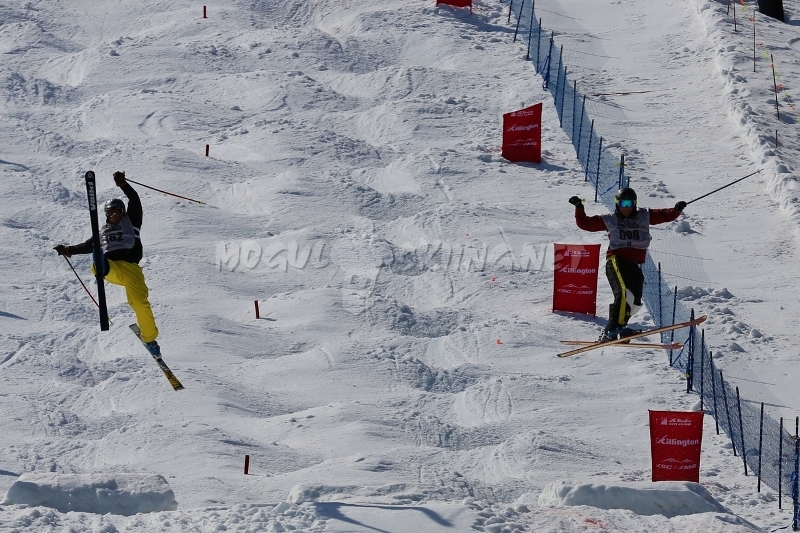 As the day wore on modest top air maneuvers and conservative skiing proved to be the most reliable path to qualifying for Sunday’s eliminations. The top sixteen women and 32 men who qualified for the main event returned to Bear Mountain on Sunday morning where an empty parking lot and overcast skies replaced the previous day's party crowds and sun. Unlike Saturday the mood was all business as competitors with serious looks on their faces made brief appearances in the base lodge prior to heading up the hill. 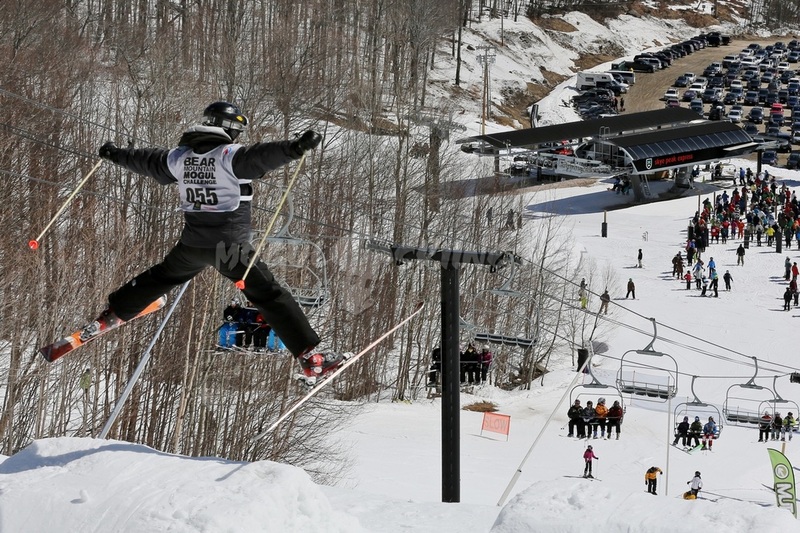 Sunday's event was held concurrently with the USSA's Spring Klassic dual moguls competition meaning runs from both events were mixed together throughout the day on the Outer Limits course. While this may have been intended to streamline operations and provide a better show, the event's staff apparently had their hands full juggling the two separate competitions resulting in athletes and spectators being forced to endure long delays between runs. When competitors did take their runs the juxtaposition of the two competitions made for an interesting contrast. On one hand the youthful USSA athletes put on a show of disciplined technical precision, painstakingly maintaining their form throughout their runs with some of the more advanced competitors executing spectacular backflips on the bottom jump. The BMMC competitors on the other hand, a large number of whom fell into the 40 and 50+ age categories, elicited loud ooo's and aaahhh's from the crowd as they either crashed out of or narrowly survived their all out, brink-of-disaster style bids for glory. The group of thirty-two men and sixteen women who made had made it to Sunday's elimination rounds was stacked with Killington regulars. And at the end of the day it was two long time Killington skiers, each of whom had competed in previous editions of the BMMC numerous times, who occupied the top spots on the podium. On the men's side Kevin Clifford of Lake George, NY managed to advance his way through a field of talented skiers to take the top spot. Having finished as high as 3rd and 4th in previous editions of the Bear Mountain Mogul Challenge, Kevin pulled out a nail biting come from behind victory in the final round to take the top spot from Jason Beaudet. As evidence of the level of talent on hand, Beaudet had made his way to the final by defeating former US Freestyle Ski Team member John Witt in the Semis. Witt went on to place fourth after crashing out of the dual for third with PJ Ricci. That meant the top four men were: 1. Kevin Clifford, 2. Jason Beaudet, 3. PJ Ricci, 4. John Witt. For the women it just seemed to be Sharon Maloney's weekend. Not only was she celebrating a birthday, but at the Pickle Barrel's post competition party the previous night Maloney had the incredibly good luck to win the top raffle prize of a one week trip to Momemtum Ski Camps in Whistler, BC. The Auburn, NH resident, who qualified 6th on Saturday, had also placed as high as 3rd and 4th in previous editions of the BMMC. On Sunday she managed to win a very close semi-final round against Amanda Forgione in order to move on to and win the final against Samantha Anderman. Thus the women's podium looked like this: 1. Sharon Maloney, 2. Samantha Anderman, 3. Amanda Forgione, 4. Jody Keefe. By the time the awards ceremonies wrapped up on the deck of the Bear Mountain base lodge the time had slid well past 4:00pm. As the festive atmosphere died down and people headed for their cars veteran Killington mogul skier Frank Chiappone summed up the mood by commenting "Bump skiing is alive and well at Killington." One year after the resort's management baffled the New England mogul skiing community by killing its most beloved event there was a collective sigh of relief amongst this year's attendees. Most seemed more than willing to forgive the resort for the past year's transgression in order to see things in this part of the universe make sense again.